Thanks to 13 local businesses, civic organizations and individuals, Sharp County sheriff’s deputies will be safer as they serve the community. When Sharp County Sheriff Mark Counts took office in January, he began a quest to insure all his officers were outfitted in new body armour. Grants that would normally make the vests available to the law enforcement officers were not available this fiscal year. So Counts, joined by local business woman Renee Clay-Circle, turned to the community to fund the 13 pieces of new body armour. 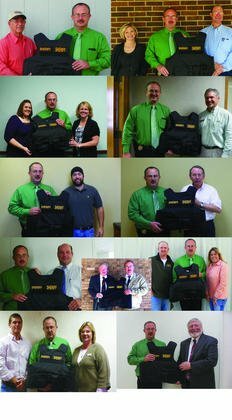 Nov. 9, the fundraising effort paid off, as vests to outfit every officer arrived at the Sheriff’s Department. Each officer was provided with a custom fitted piece of new body armour. Counts said he was extremely grateful to the businesses and civic organizations who donated the $7,620 to cover the cost. Counts and Circle made visits all around the county, personally thanking each business for their support and generosity. Statistics compiled by the National Law Enforcement Officer Memorial Fund show that law enforcement fatalities have been on the increase, from 135 in 2010 to 154 so far this year, a 14 percent increase. Of these fatalities, over a third were firearm related, proving the need for the vests to protect the lives of the men and women who serve their communities. While the vests can be cumbersome and hot in the summer months, the benefits of wearing them is something that cannot be argued. These vests can also save lives in other ways besides protecting against gunfire. A policeman’s life was spared in Texas following an incident where he responded to a domestic call and the suspect threw gas and ignited the officer’s body. Although he suffered severe burns, the vest protected his torso, allowing doctors to graft skin, ultimately saving the officer’s life. The vests also protect from severe blunt force trauma. In Virginia, a state trooper’s door was left imprinted in his new body armour after being rammed by a suspect’s vehicle pinning him between the door and body of his vehicle. Although he suffered severe injuries, doctors determined the new body armour was instrumental in saving his life. These are just a few of the stories documenting the need for body armour in law enforcement, although in 2006, less than a third of state and local agencies issued their officers the bullet proof vests. Through various technical advancements and research for both comfort and protection, many companies now produce the new body armour for the law enforcement community, and the number of agencies requiring their officers to wear the protective vests are going up. As advancements have lowered the weight of the vests while increasing the protection they provide, many body armor manufacturers have gained repeat business of both law enforcement and the military. As a result, since 1987, more than 3,000 law enforcement officers have survived ballistic and non-ballistic incidents as a result of wearing the body armour. The Sheriff’s Department and officers are grateful to the community for their support and donations.